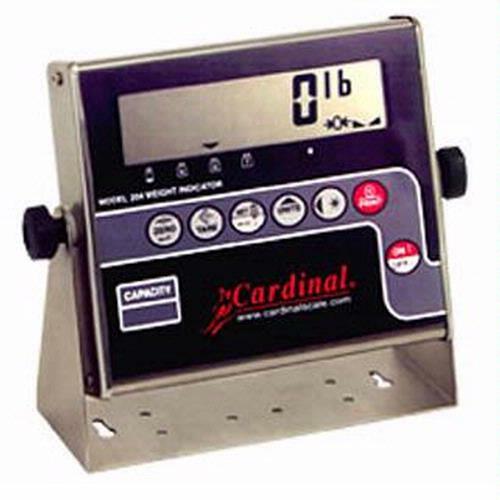 deal for floor and bench scales, the 204 indicator features a large 1-inch/25mm high, 6-digit LCD for high visibility and a rugged stainless steel enclosure. Selectable weight units, along with Gross, Tare, and Net conversion functions as well as metric conversion make this indicator suitable for many applications. Whether a static installation or a portable scale, the 204 can be powered up to 3 ways: AC, Alkaline batteries, or rechargeable Ni-Cad batteries that charge via a built-in battery charging circuit. A bi-directional RS232 serial port, custom label/ticket format, auto shut-off and sleep modes to conserve battery power allows you to tailor the 204 to your needs. NTEP legal-for-trade and OIML certified. Supports up to 4 350-ohm load cells.